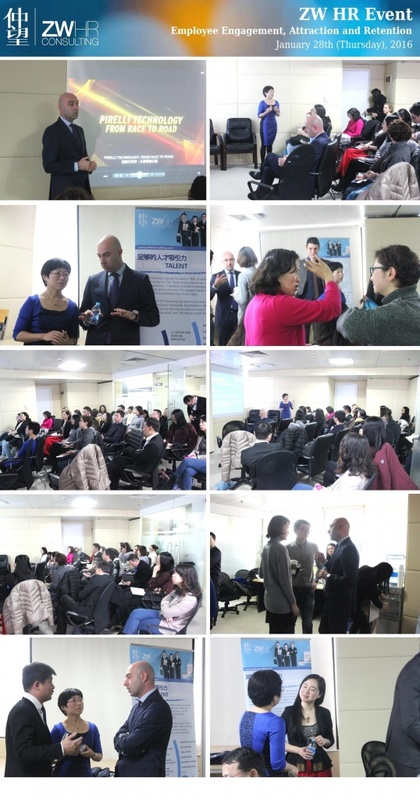 ZW HR Consulting successfully hosted HR event in Shanghai on 28th Jan 2016 on “Employee Engagement, Attraction and Retention” with Mr Rodolfo Morandin (HR Director at Pirelli) and Joyce Jing (General Manager at ZW HR Consulting). In attendance was a broad selection of HR professionals from Senior HR Managers, HRBP and HR specialists covering Talent Acquisition, L&D, C&B to name a few. Industries ranged from Pharmaceuticals, Manufacturing, FMCG, Finance, Technology and more. We hope that you found the seminar informative, relevant, and worthwhile. Thank you to all who attended the event.